Ella Fitzgerald, Cannonball Adderley, Louis Armstrong, Count Basie, Louie Bellson, Ray Brown, Benny Carter, Buck Clayton, Paulinho da Costa, Buddy DeFranco, Roy Eldridge, Duke Ellington, Herb Ellis, Tal Farlow, Stan Getz, Dizzy Gillespie, Lionel Hampton, Bill Harris, Coleman Hawkins, Johnny Hodges, Billie Holiday, Milt Jackson, Illinois Jacquet, Hank Jones, Barney Kessel, Gene Krupa, Howard McGhee, Thelonious Monk, Bill Evans, Gerry Mulligan, Anita O'Day, Charlie Parker, Joe Pass, Oscar Peterson, Flip Phillips, Bud Powell, Buddy Rich, Charlie Shavers, Sonny Stitt, Art Tatum, Ben Webster, Lester Young, among many others. Born in Los Angeles, the son of Jewish immigrants from Tiraspol, After school, he began work as a stock clerk on the Los Angeles stock exchange. When America joined the Second World War, he was drafted into the US Army Air Force. Subsequently, he was posted to the Morale branch, the department charged with troops' entertainment." He then emerged into the public view when he organised desegregated jam sessions at the Trouville Club in Los Angeles, which he later expanded when he staged a memorable concert at the Philharmonic Auditorium in Los Angeles on Sunday, July 2, 1944, under the heading of "Jazz at the Philharmonic". Her died on November 22, 2001, aged 83, in Geneva, Switzerland. Granz also spearheaded the fight to desegregate the hotels and casinos in Las Vegas, arguing that it was unfair that black artists could perform on the stages, but could not stay or gamble at the hotels, or even enter through the front doors. Granz was also interested in art, developing relationships with Pablo Picasso, whom he met in 1968. 1 2 Richard Severo (November 27, 2001). "Norman Granz, Who Took Jazz Out of Smoky Clubs and Put It in Concert Halls, Dies at 83". New York Times. 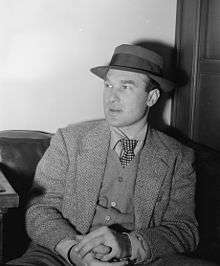 ↑ Michael Freedland, "Norman Granz: Verve record label founder who gave jazz respectability and integrated audiences", The Guardian, November 26, 2001. 1 2 3 4 Obituary Norman Granz, The Independent, November 25, 2001. Retrieved November 20, 2008. ↑ Tad Hershorn, Norman Granz: The Mad Who Used Jazz for Justice (Berkeley: University of California Press, 2011), 324.